The Pentagon has made progress improving its IT systems in recent years, but it still faces about 266 outstanding cybersecurity-related recommendations from past watchdog reports that it must address. These findings come as part of a Jan. 9 inspector general summary of Department of Defense cybersecurity audits issued in fiscal 2018 regarding its compliance with the National Institute of Standards and Technology’s Cybersecurity Framework. Generally, the report found that “DoD Components implemented many of the agreed-upon corrective actions necessary to improve system weaknesses” from the prior year’s report. 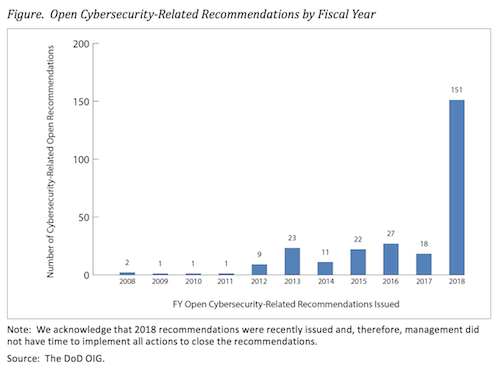 That said, the department “still faces challenges in managing cybersecurity risk to its network,” the report finds, pointing to the 266 existing recommendations from past departmentwide reports as of Sept. 30, 2018, including 151 from fiscal 2018 alone. Some of oldest weaknesses date as far back as 2008. The biggest pain point identified in the report is DOD’s struggle with IT governance. The summary report goes on to dive into each of the five function areas under the NIST Cybersecurity Framework: identify, protect, detect, respond and recover. “As the DoD continues to face a growing variety of cyber threats from adversaries, such as offensive cyberspace operations used to disrupt, degrade, or destroy targeted information systems, the DoD must ensure that cybersecurity risks are effectively managed to safeguard its reliance on cyberspace to support its operations,” the summary says.